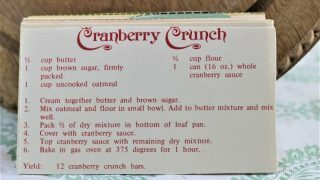 Front of the recipe card for Cranberry Crunch. 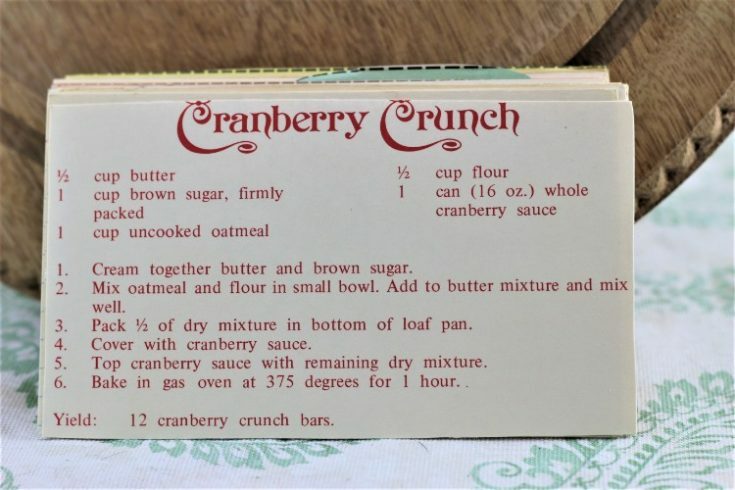 There are lots of fun recipes to read in the box this recipe for Cranberry Crunch was with. Use the links below to view other recipes similar to this Cranberry Crunch recipe. If you make this Cranberry Crunch recipe, please share your photos and comments below! Yield: 12 cranberry crunch bars. Cream together butter and brown sugar. Mix oatmeal and flour in small bowl. Add to butter mixture and mix well. Pack ½ of dry mixture in bottom of loaf pan. Top cranberry sauce with remaining dry mixture. Bake in gas oven at 375 degrees for 1 hour.